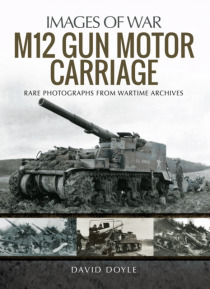 Although only 100 examples were produced, the 155mm Gun Motor Carriage M12 served with distinction as an infantry-support weapon and in particular as a bunker-buster during the U.S. assault on the Siegfried Line in the winter of 1944-45.The ability to rapidly ready heavy artillery for firing lead to the development of the M12 155mm gun in 1941, based on the M3 Medium Tank chassis. The trial vehicl… e, built by Rock Island Arsenal, was designated T6\. To accommodate the large, rear mounted weapon – a French-made M1917 155mm gun, the engine was relocated forward to a position just behind the driving compartment. A hydraulically operated spade mounted at the rear of the vehicle, which was lowered during firing to anchor the vehicle against the recoil. When retracted into the travelling position it provided a seat for two of the six crewmen.The production run was between September 1942 and March 1943, with a total of one hundred units being built. Though a few were used by training units, most were placed in storage until February 1944, when the first of 74 of them were shipped to Baldwin Locomotive Works to be improved based on further tests and usage in training. This work continued until May 1944.Three slightly different WWI surplus weapons were mounted depending upon availability, the M1917, the M1917A1 and the M1918M1. The M1917 was French built, the M1918 was US built, and the M1917A1 had the French gun tube, and the US breech.The M12 would earn the nickname "Door Knocker" for its pounding of the German Siegfried Line.